Malawi, Nkhata Bay and I was talking to Dominicue, a very affable friendly fellow travelling with his family though Africa. After several minutes exchanging our thoughts and details of our respective travels we moved onto discussion of the future places we were looking to travel to and through. 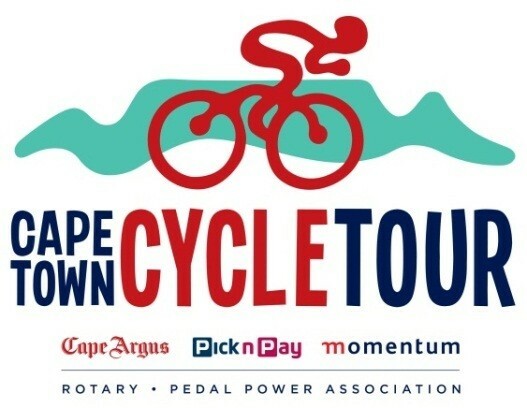 Dominicue casually mentioned a cycle event I might like to consider should I be Cape Town at the right time, the Argus Cape Town Cycle Tour. 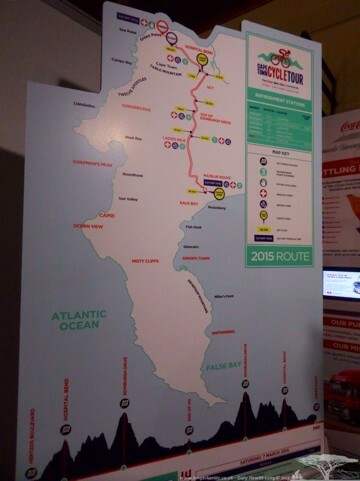 I’d not previously heard of this event, I know about most of the large events in the UK and in and around Europe, but as far as African Cycling events go, the Tour d’Afrique was about as much as I was aware of. Dom went on to further explain about this ride explaining that it was the worlds biggest event. 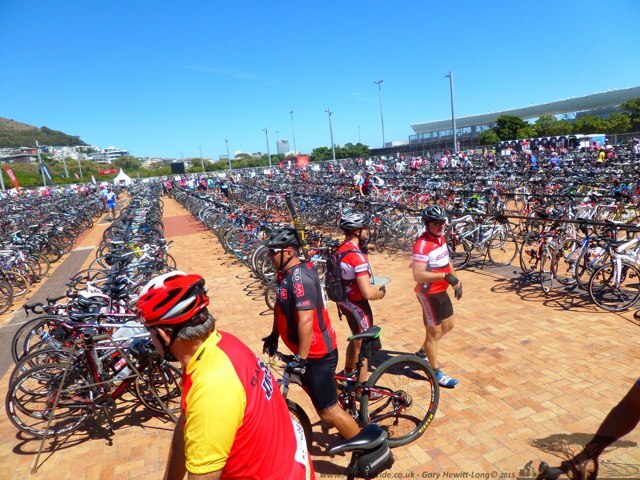 To be honest as he mentioned it I found it hard to believe, really Africa having the worlds largest cycle event? Surely the largest participating event had to be either in the USA or Europe? Apparently not! Intrigued by what I had been told I thought I’d do as Dom suggested and take a look on t’internet! 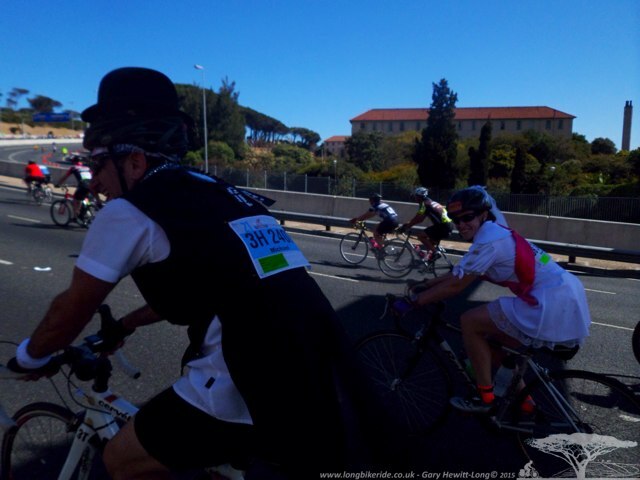 I must admit after reading up online about the event it turns out to really be the largest event I heard of, between 35,000 and limited to 42,500 participants each year in what is effectively a sportive but with a pro race thrown in and the start. I was warned to get an entry in early as places sold out very soon after opening. 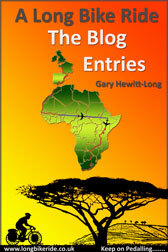 Luckily organisers hold back entries for international entrants. Closing date for international entrants was on the 20th February 2015 subject to places still being available. 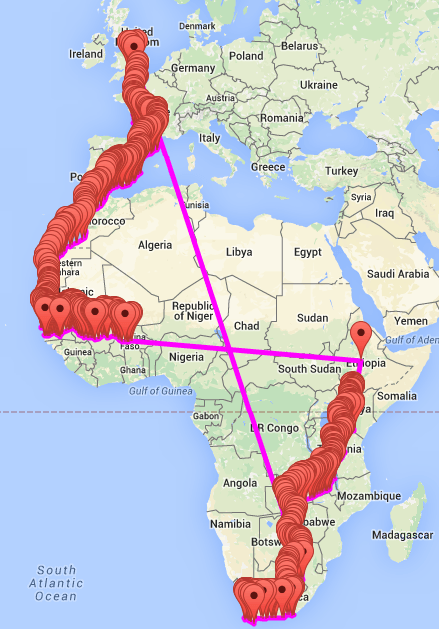 The places for South African riders go on sale and are gone in five days. 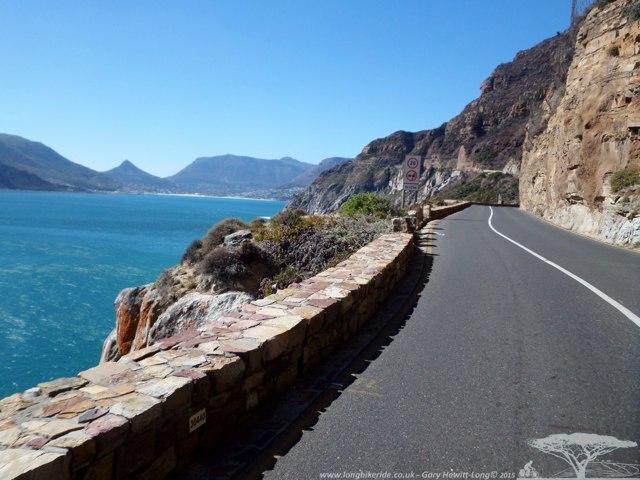 As I was unsure as to whether I would be in Cape Town at the right time I left my entry until early February to be sure that I would be in Cape Town at the right time. Entry was easy, apply online as an International (730 Rand) and I chose to order a t-shirt and some arm warmers, the latter may come in handy when I arrive back in the cold of the UK. 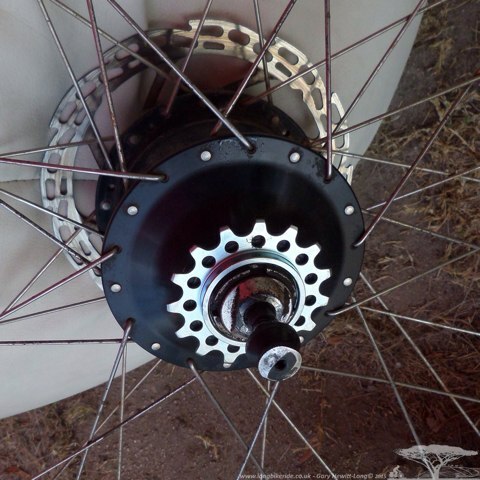 As I had been invited to do the prologue at the Cape Rouleur and I was entering the Argus, I had ordered a smaller rear sprocket to give me some higher top end speed. 17 Tooth Sprocket off… 15 Tooth Sprocket on, should be able to pedal downhill now! 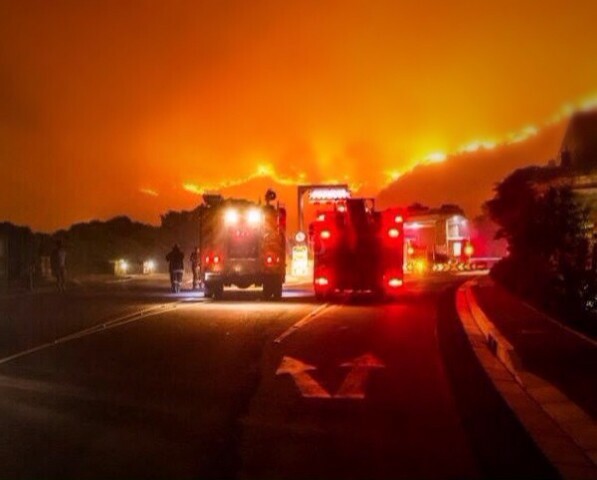 News came through before the tour that there was a wild bush fire along the route, around the Chapmans Peak area. 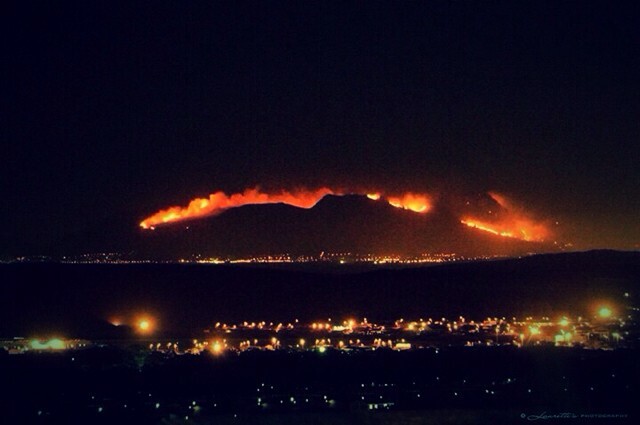 The fire started over a week before and soon turned into the largest bush fire the area had seen for over a decade. 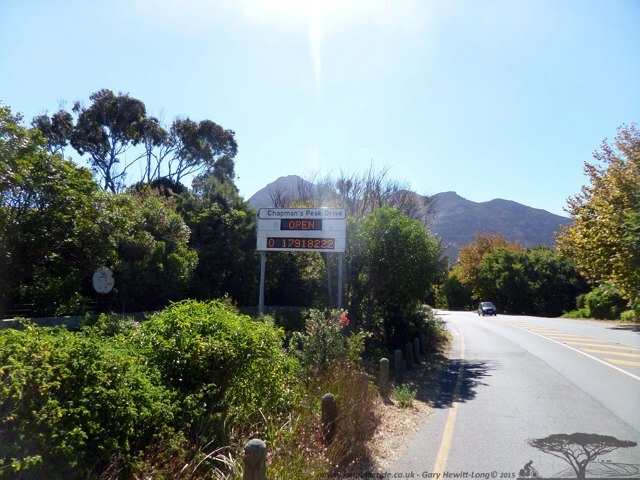 The Fynbos plants actually need fire to germinate them, fire is part of the natural ecology but tends to happen more often than it would naturally with the human factor, discarded cigarette butts or stompies as they are known here. The fireman worked around the clock to contain and extinguish the fire which consumed most of the mountain at one point, they managed to put out the fire before the start of the ride. 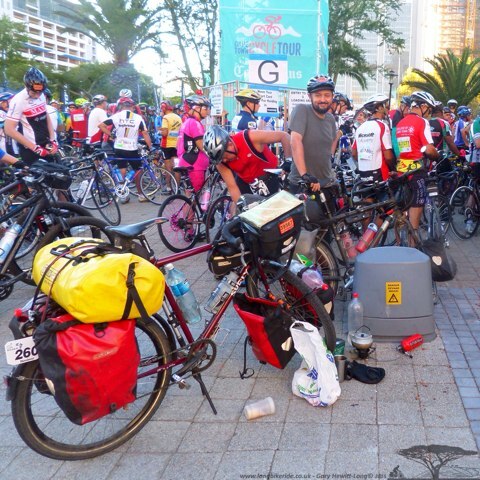 Further news was sent out by the race organisers that due to the fire, chance of it restarting and the amount of ash along the route that it would not be safe to ride the normal route. 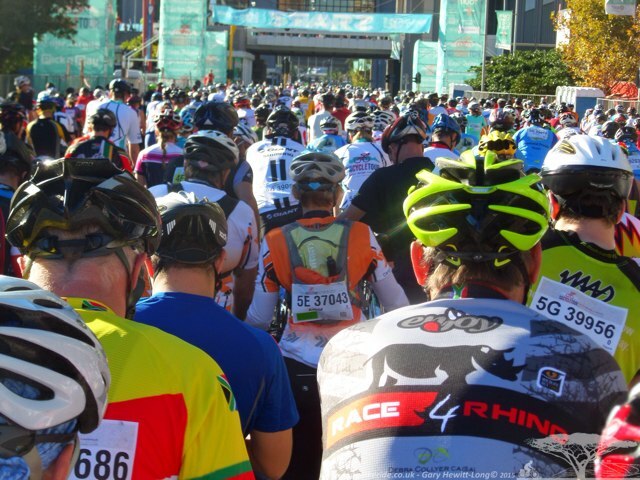 Instead a backup route had been planned which significantly shortened the 109km race to 47km and kept riders away from the mountain. The Thursday before the race riders could pick up their timing chips and race packs. Staying with warm showers hosts Wym and Hanlie in Woodstock, Cape Town was ideal, only a few km from the pickup point where organisers also arrange a cycling expo. 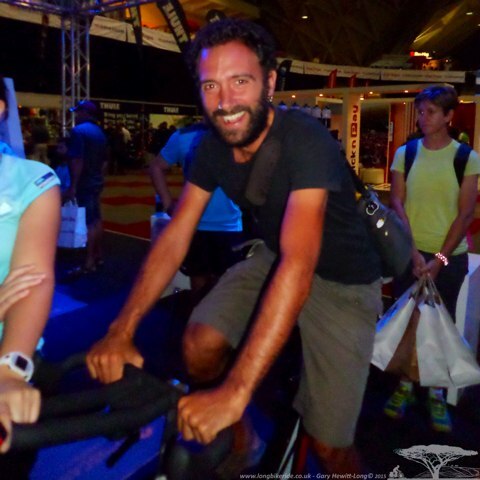 Also staying with Wym and Hanlie was fellow long time cycling traveller and photographer Nico Marino who decided to visit the expo with me. One of the stands by an energy drinks company was setup to do fat test measurements and fitness levels. Nico and I decided to have a go, Nico first was measured, height, weight, fat percentage and so on. Check out my fat content..
After being measure we were then put onto a watt bike to test his cycling stroke etc. After Nico it was my turn, Nico had come out of the test as being ‘Athletic’ with a fat percentage around 12.5%, unfortunately I didn’t anymore, I am now in the ‘fitness’ bracket and mine was over 15%. Several people I had met along the way were also entered into the race. It was good to meet up with Seneo, her brother and friends. Seneo and her husband hosted me in Gaborone, Botswana before Christmas. The Day of the race, organisation is good and the routine well practised for the event which this year was in its 38th year. I met up with Urs Schneider the cyclist I had first met in Malawi to ride to the start together. Urs and I had spoken about how to ride the event previously in the pub, we’d decided as the route had been shortened we should both ride our bikes all our touring equipment, but with one exception. 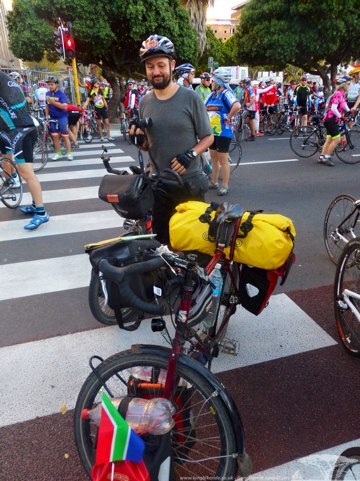 Remove items from one of the front pannier and substitute the normal kit in that bag with beers and ice. 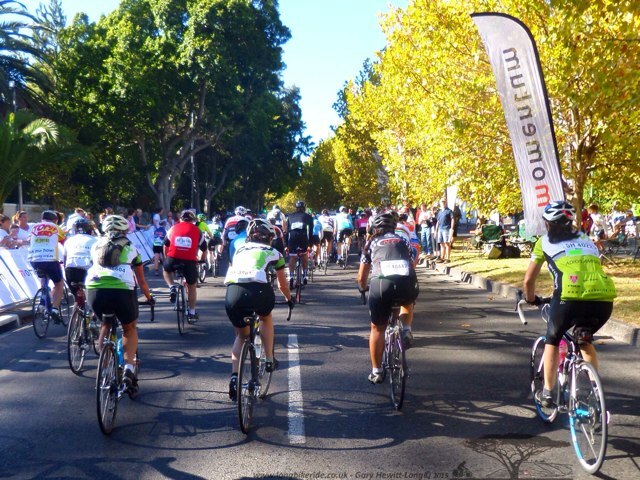 Its our turn into the start gate next..
We filtered in toward the start gates amongst thousands of other cyclists. Each of us had been allocated a group with a set arrival time, load time and starting time. Amongst lots of other cyclists on road bikes, some on mountain bikes Urs and I attracted quite a bit of attention with our laden bikes. 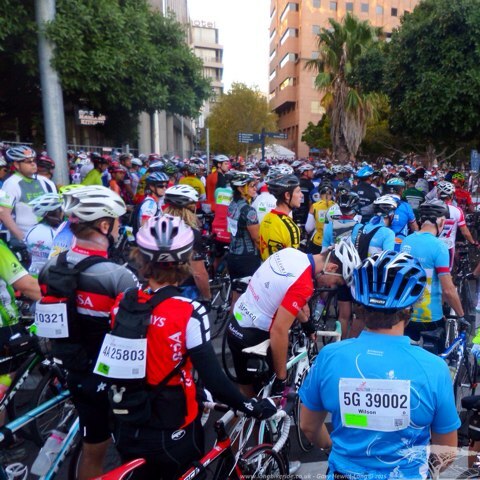 The crowd of cyclists were moving very slowly to get into the loading pens, the gateway being obstructed by a car. One of the marshalls suggested opening one of the sections of fencing and was calling for another marshall to get some tools to cut the cable ties to one of the panels. No problem, Urs and I both had the tools on our bikes and we opened the gate to several cheers by onlookers. Once in the pen there was still a half hour wait until we got called to be loaded into the start chute, so what to do? Time to make a cup of tea and eat some of the Cinnamon rolls I had bought along. For some reason this also gained rather a lot of attention. This is taking a while – Time for a brew! Eventually our group 5G was called forward to be loaded into the start chute and then again called forward for the start. Music playing and a guy on a microphone doing his best to build up anticipation for the start. And then we were off… slowly. Unlike Ride London where the off means everyone is up to 25mph within a few yards the start of the cycle tour, or at least the group I started in was very time, slowly riding out onto the course. A few miles down the road and the first feed station loaded up with cokes. As I wasn’t really going for a great time then it was worth stopping, approached by another marshall asking why I had all the bags. 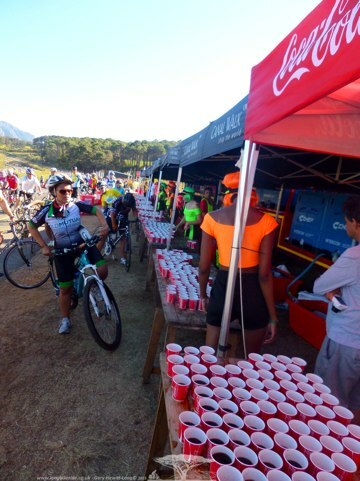 Feed Station along the Route – Lots of Evil Coke! 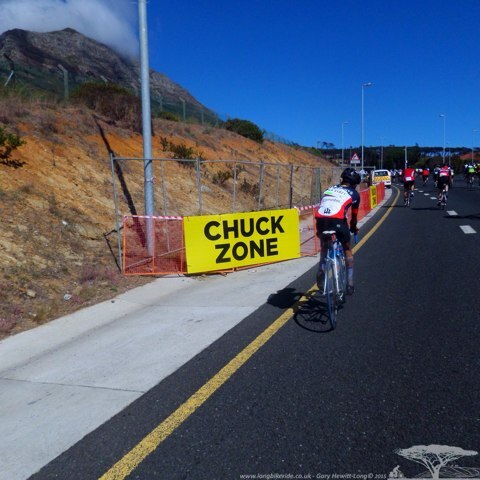 Due to the very short route it was only a couple of hour ride, coming back into the centre of Cape Town there was a sign reading ‘Chuck Zone’, I saw no one chucking up, but several riders were discarding old water bottles and used gel wrappers into the area. Chuck Zone – Didn’t look like anyone had thrown up! 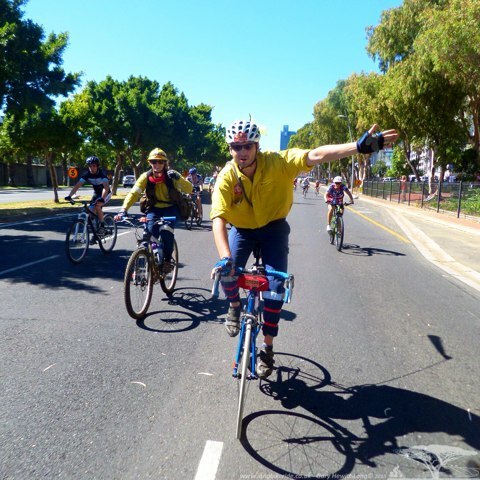 Several other cyclists were riding in an unconventional way, one guy on a unicycle, a couple wearing wedding outfits and due to get married the following week. The groom joking they were entering just so he could see how good his fiancé looked in lycra. Several firefighters who had worked on the mountain putting out the wild fire were entered into the race and had decided to wear the uniforms much to the appreciation of the other riders who congratulated them along the way. 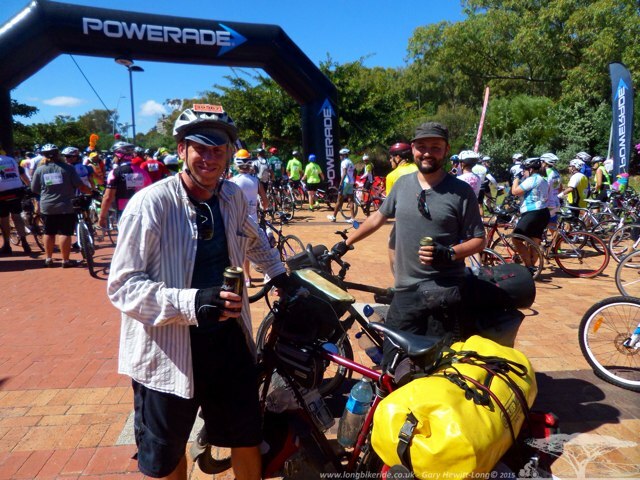 One of the advantages of completing the ride on a touring bike was our ability to carry beer with us. The number of riders coming back in at the end of the tour meant a bottleneck at the finish line. 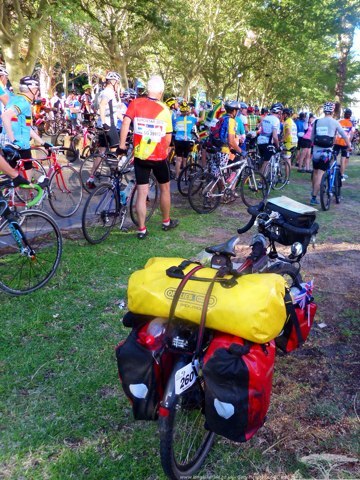 Not to worry, reach down to the front left pannier and grab an nice ice cold beer! Urs and I at the end, the only ones who’d thought to carry Beer and Ice with us..
Riders parked their bikes in the secure bike park to go and get their refreshments, the value of all the bikes there beyond comprehension..
Loads of bikes – There is a few quids worth there! 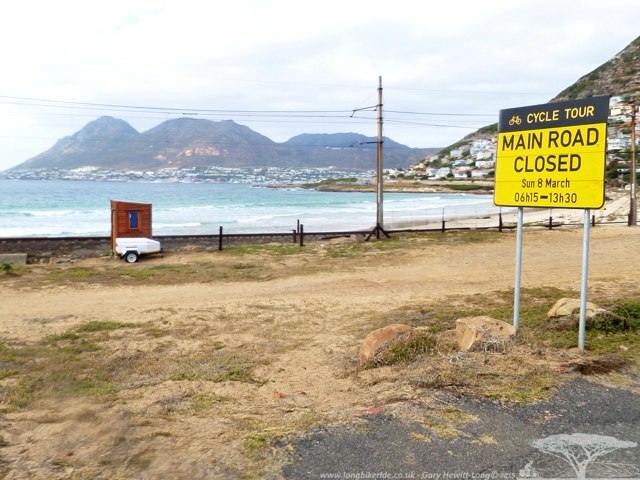 The day after the Argus, the closed route and Chapmans peak were re-opened, Urs and I decided to ride the original route. Signs had been placed up a week before the call had been made to switch to the alternative route. We rode the route slowly, taking in the scenery and looking at the signs you don’t get in Europe. No, it’s not a penguin, its Urs from Germany! 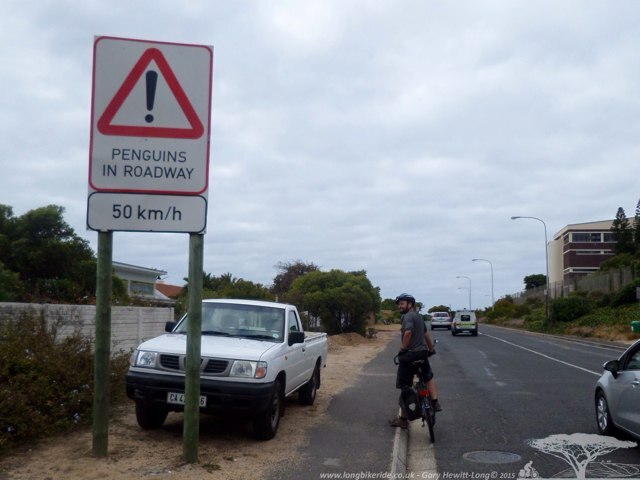 Not on the route for the Cape T Cycle Tour but as we were riding past it we also rode to Cape Point. 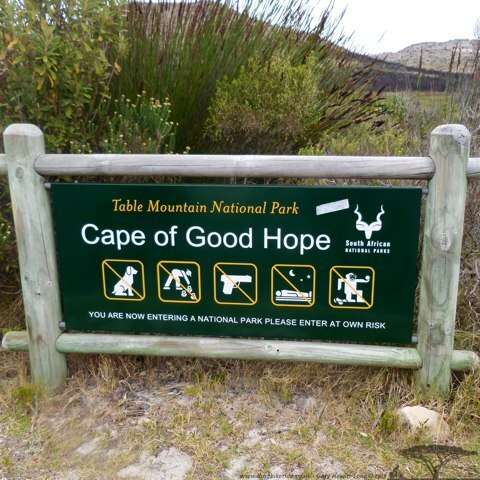 Cape of Good Hope, the warning on the far right a little odd..No monkeys breaking balls in an Egyptian Stylee?? Cape Point, part of the national parks, entry was 110 Rand.THe sign also said cycling another 110 Rand, but this wasn’t charged. Several tourists were there also to look out from the point. 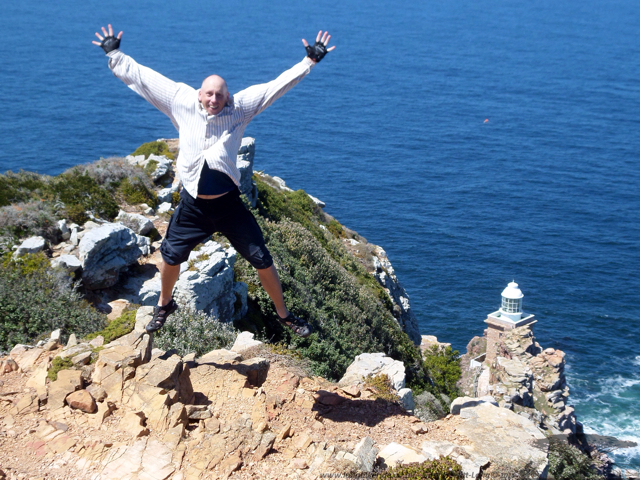 Officially I had not set an end to my African Trip, but being at the Cape Point felt like as good a place as any. 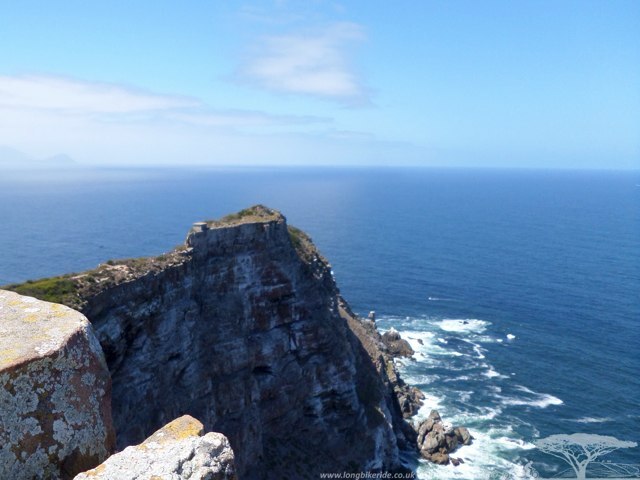 Yay – Made it to Cape Point… Celebrate by having no neck..
A shame not to have been able to ride the original route, but still lucky the route had been reopened so as we could ride it before leaving for home. The scenery was breathtaking and in hindsight probably more enjoyable without lots of other cyclists around which would have required more concentration while on the road, the lack of cyclists and low volume of traffic allowing the stunning scenery to be fully appreciated. It’s truly an amazing place, barren now with burnt out bushes and veld, the ash covered soil giving off that distinctive burnt soil odour..
My final result, not too bad seeing as my bike was a wee little bit heavier than most other riders.